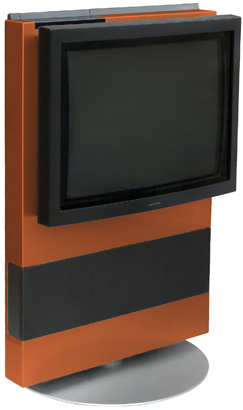 The first Beocenter model to include a television. The concept of combining a television with a compact disc player, radio and loudspeakers was certainly new, and the AV5 looked both compact and attractive, similar to the very successful Beovision Avant, only smaller. Text copyright © Beocentral. Unauthorised reproduction prohibited. The cabinet included three loudspeakers, a central bass unit and two separate enclosures at the sides, which were moved outwards by a small motor when the system was switched on. The CD player was placed on the top of the cabinet, taking an unusual form, where the disc rotated in free air, without the normal drawers or covers. The display across the top also catered for the FM radio. A Beo 4 terminal completed the package, but the system could be expanded with accessories such as a satellite receiver, modulator and any number of Master Link products. Text copyright © Beocentral. Unauthorised reproduction prohibited. The AV5 was conceived as something a bit special, as the CD player was also a video source. Ill conceived is probably a better expression, as by the time it was launched, formats such as CD-I and PhotoCD, the type of systems the AV5 was based around, were dying through lack of interest, making the AV5’s centerpiece useless. Worse still, the AV5 could not play DVDs, the now established video CD format with a large range of titles. Nor could it read PC style CD ROMs, another established format. As if this was not bad enough, the cost of this useless hardware made the AV5 cost nearly as much as the widescreen Beovision Avant, which also included a rather more useful VHS video recorder. Text copyright © Beocentral. Unauthorised reproduction prohibited. So, how about a video recorder for the AV5? Unfortunately, the CD-I gear and the complex mechanism for moving the loudspeakers filled the space that housed the video recorder in the Beovision Avant, so a separate machine such as the Beocord V 8000 would be needed, raising the cost way above that of an Avant, and ruining the idea of a stand-alone integrated system. The mechanism for moving the loudspeakers themselves was also of dubious value: no-one complained that the loudspeakers of the Beovision MX 7000 were too close together, and they provided excellent quality reproduction. In this light, the motorised loudspeakers look like a gimmick, something which clashes with the image and philosophy of B&O. Text copyright © Beocentral. Unauthorised reproduction prohibited. Despite these failings, the AV5 was not all bad. As a 25” 4:3 television and CD player/radio, it performed to a very high standard, and the styling looked sharp, especially in the colours in which it was offered. However, when one compares the price with that of a Beovision MX 7000 and a Beosound Century, it makes no sense—and that’s a shame. Text copyright © Beocentral. Unauthorised reproduction prohibited.